On the mat and in business, success depends on the ability to know what's going on in any given circumstance. The Smart Dashboard gives you instant access to dynamic, up-to-date data about your martial arts school from one central view. 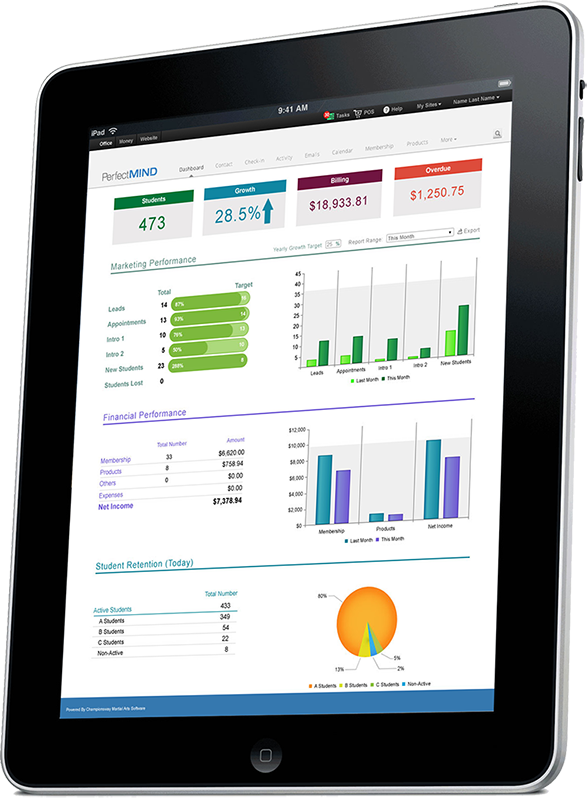 View real-time insights on your number of students, growth rate, overdue payments, and more. Stay on target by setting goals and monitoring your growth. Monitor how many leads were generated and how many turned into registered students, all measured on a weekly, monthly, and yearly basis. Evaluate what area of your martial arts business needs improvement and read trends in your data by viewing month-over-month comparisons. Easily analyze statistics to see if you need to focus on student acquisition or student retention. The 24-Hour Report provides you with a daily snapshot of your school performance right in your email inbox.